Wednesday's Quilt Market re-cap - Stop staring and start sewing! Okay! The winner of yesterday's lovely Robyn Pandolph charm pack is Lala!! Woohoo Lala!! C'mon down! One of my goals for this market was to finally meet Pam Kitty Morning in person. I missed seeing her in Portland and it's been bothering me ever since! So I wrote Elizabeth's booth number on the palm of my hand (I got it off Pam's blog) and then tried to be careful to not wash that hand real well. I tracked them down on Sunday and here we are in Elizabeth's darling booth. She designs beautiful quilts and other wonderful fabricky things! It's Elizabeth on the left, then me in the middle, then Pam. Fun! 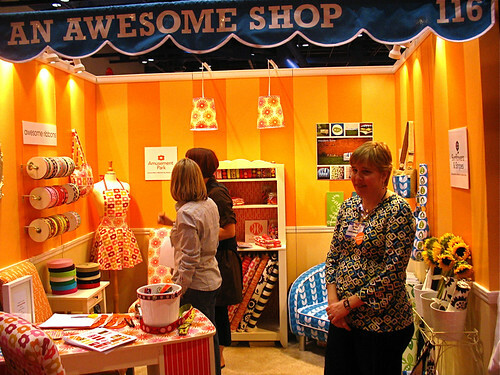 Here is the booth of Caroline (of J Caroline creative fame) and Jessica Jones (fabric designer and all around nice gal). It was orange creamsicle gorgeous and won the award for best new booth. Here is Caroline with that "If one more person takes my picture...." look. She is a truly generous person (she's one of the gals behind the fabric 2.0 party) and super nice to boot! And speaking of celebrity sightings....look! 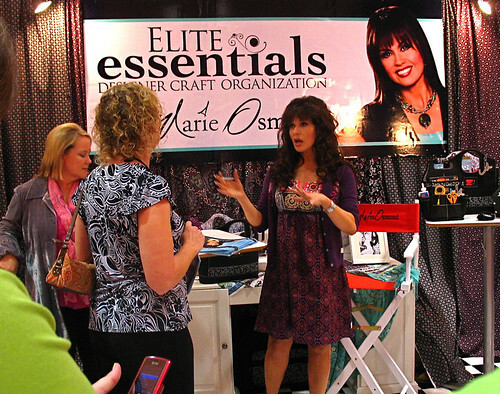 Marie Osmond!!! Seriously! And she is just darling (and a little bit country!) in person. See for yourself! 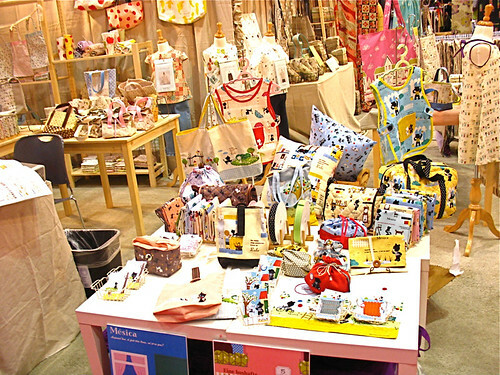 One of the cutest companies in the fabric world is the Kokka/Seven Islands group. 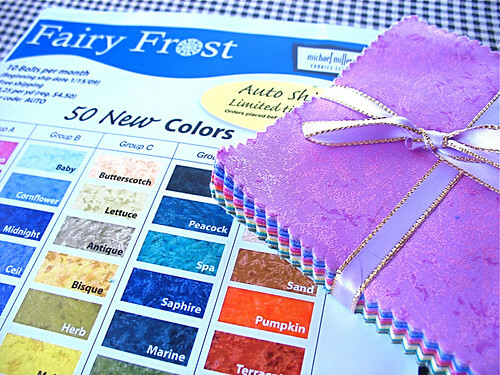 Their fabric is so sweet and soft. I love the linen-y fabrics and the people are really nice. They have all sorts of fun extras like buttons, lunch boxes, and ribbons. And look at their felted food!! 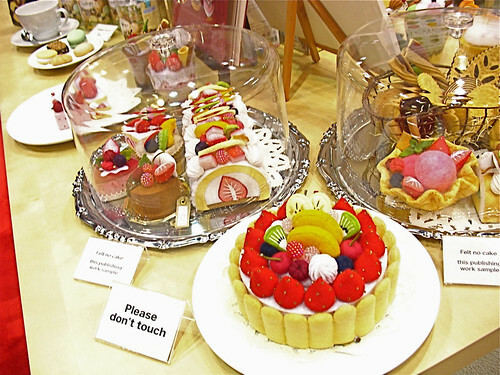 I had my grubby hand halfway to that fruit tart before my eyes saw the sign. Darn! 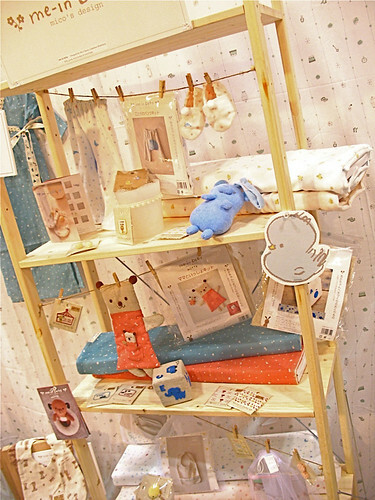 And hold onto your uterus because if you don't have a baby already you're going to want one when you see this display! 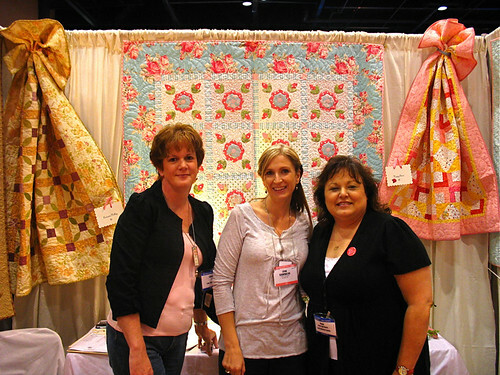 And here's some quilting (it's quilt market, remember). 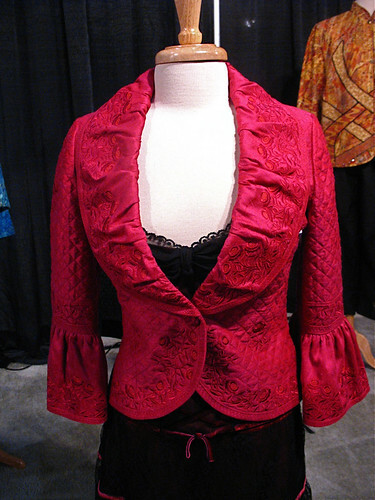 This jacket is simply exquisite and I can't imagine the hours of work that went into it. And I love the idea of quilting you can wear out and about instead of draping it over your couch (not that there's anything wrong with that! ).